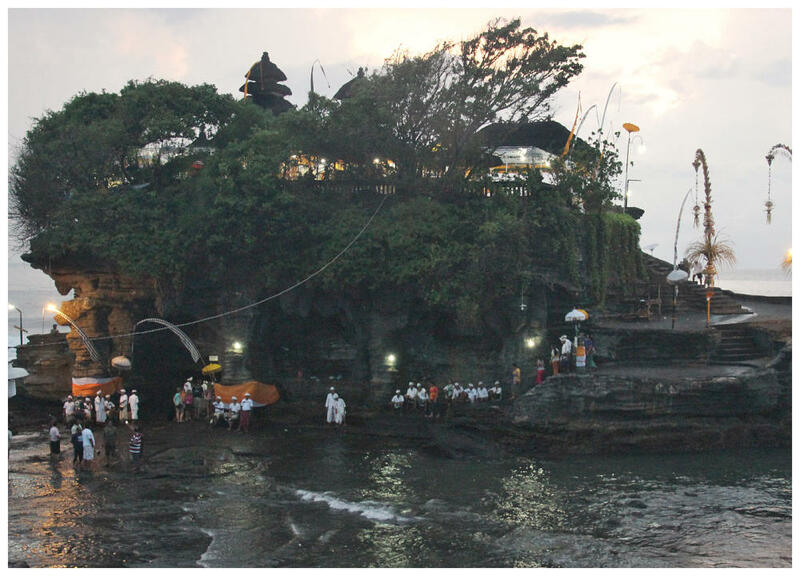 Tanah Lot is a pilgrimage temple located on a small rock formation just offshore. 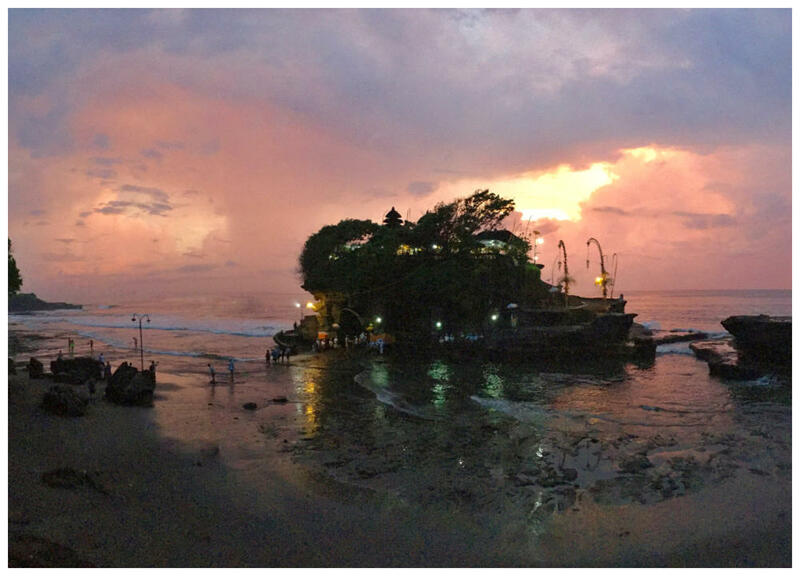 Tanah Lot, which means “Land in the middle of the sea”, is said to be the work of Nirartha, a 15 century priest. On his instructions the local people built a temple to worship the Balinese Sea Gods. The locals believe the island is protected from evil spirits and intruders by snakes. They also claim that there is a giant snake created from Niratha’s scarf especially to protect the temple. At high tide, the shape of the rock, which looks like a large boat, gives the temple a floating appearance. At high tide the temple is completely cut off from the land but the temple can be visited during the low tide. For a small donation you can be blessed and can then walk some 10 metres around the side on a path, that eventually leads up to the temple. You are not allowed any further and cannot go up to the temple unless you are in Hindu dress. The best view is from standing on the sandy shore. It is spectacular at sunset. There is a footpath to the raised cliff area just to the south from where the views of the temple and the sun set behind it are said to be outstanding. 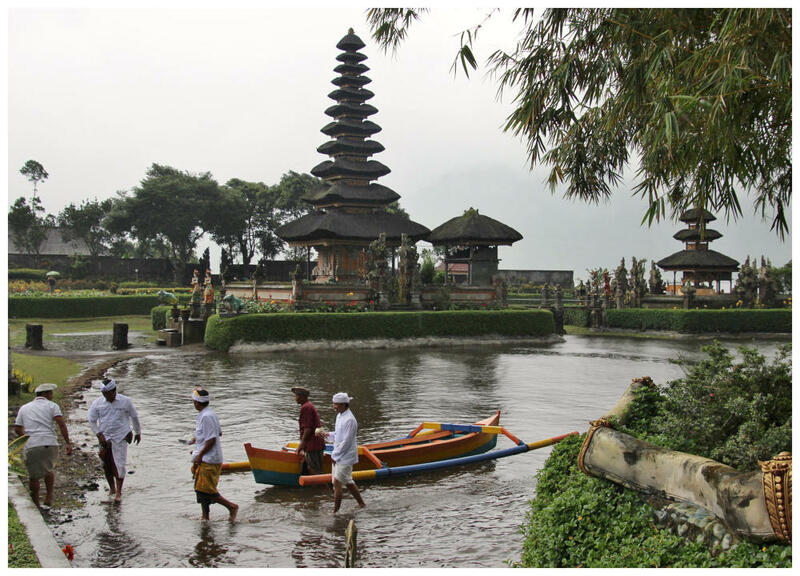 Ulun Danu Beratan Temple is a beautiful Hindu Temple that sits on the western shore of Lake Bratan and it can give the illusion of actually floating on the water. 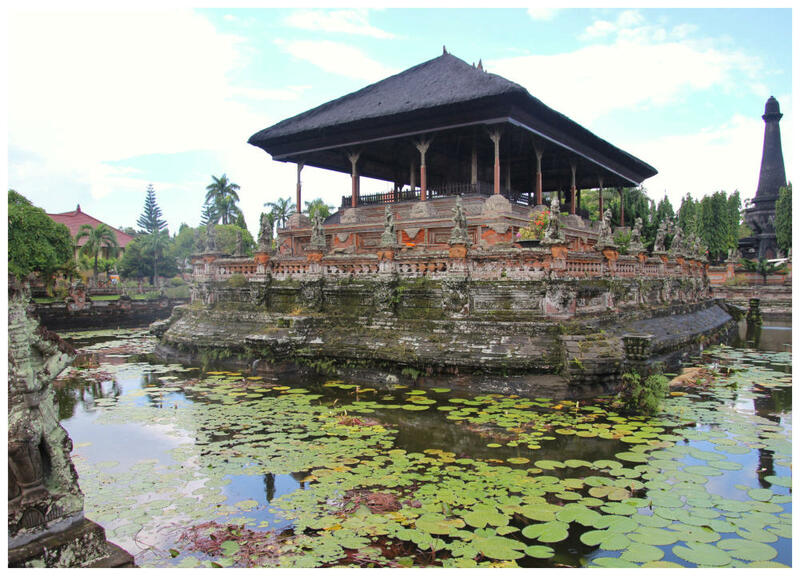 Built in 1633, the temple is devoted to Ida Batara Dewi Ulun Danu, goddess of the lake. 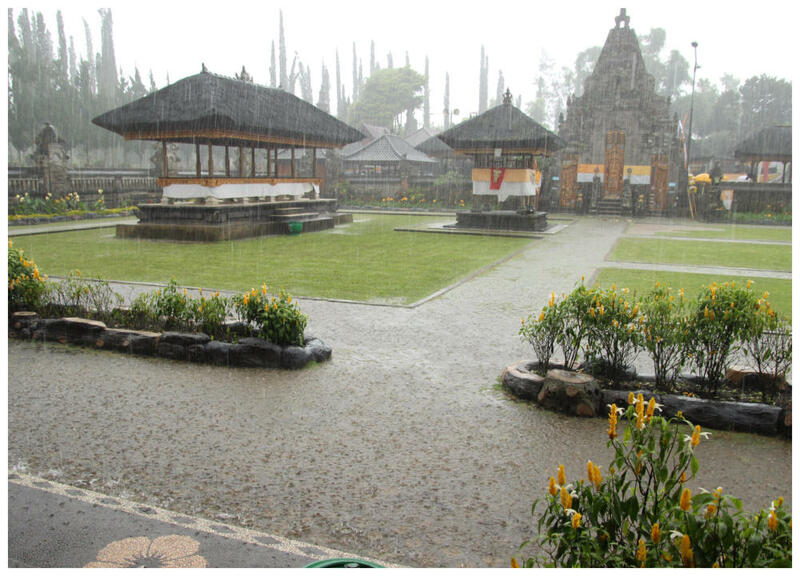 Ceremonies are often held here to pray for the continuous supply of water to Bali's farmers. A beautiful temple in a truly stunning setting. It is a beautiful sight to see the misty tops of the volcano Gunung Catur towering over the lake. Even though you can't enter the temple, the complex is really worth the visit. A beautiful temple in a truly stunning setting. Unfortunately, we were there during a very heavy downfall of rain - 2 inches of water fell in about 10 minutes leaving us cut off as we stood in one of the outer temples for shelter. 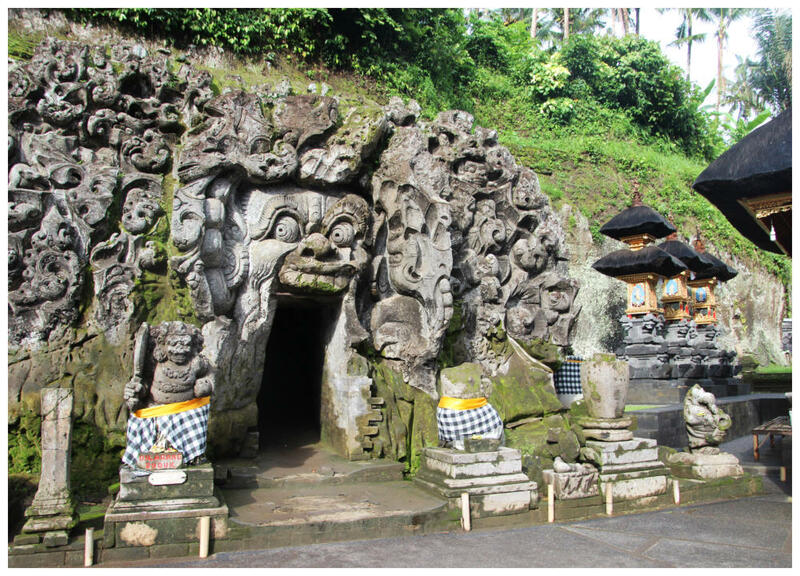 Besakih is Bali's largest and most important temple and an important part of the local Balinese Hindu faith. 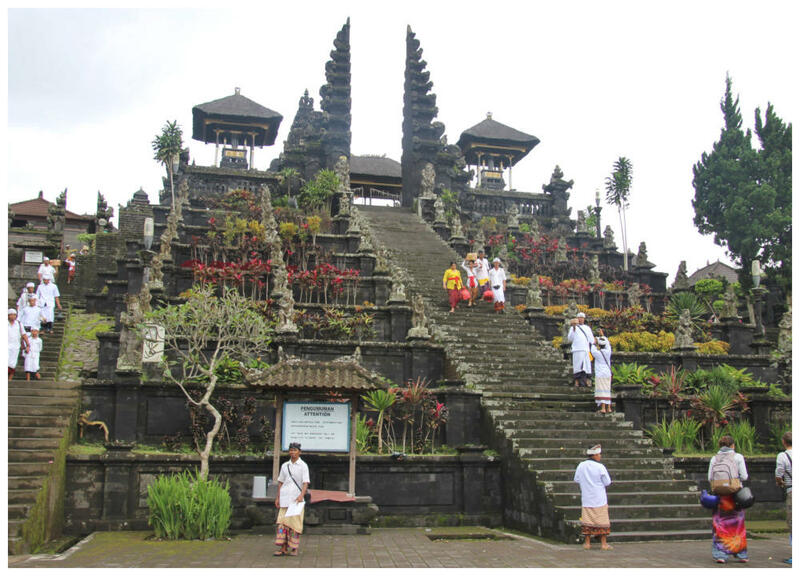 The "Mother Temple" is located at an altitude of 3000m, on the slopes of sacred Gunung Agung (Bali's highest mountain) in East Bali. The sprawling temple complex is actually made up of 23 separate temples, some of which date as far back as the 10th century. Named after the Dragon God believed to inhabit the mountain, it's said to be the only temple where a Hindu of any caste can worship. The temple constitutes a powerful religious icon that unifies thousands of Hindu followers from different castes throughout Bali and beyond. More rain! 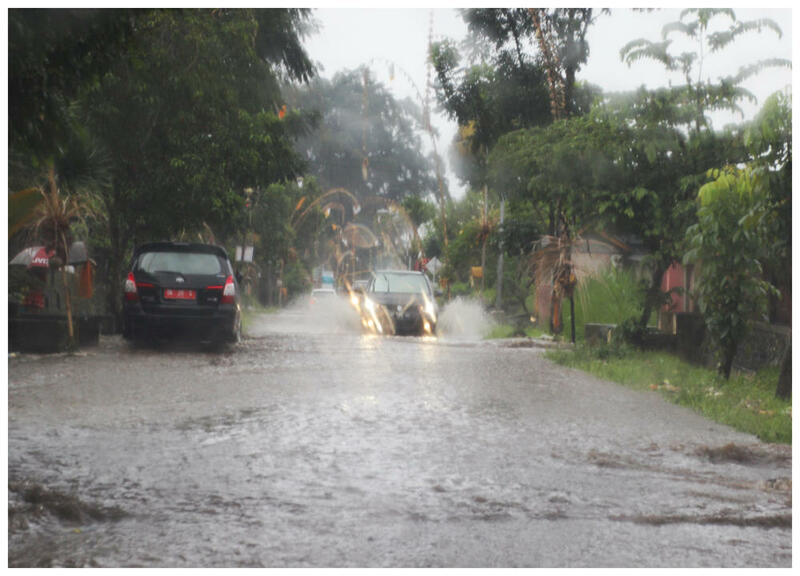 A very heavy downpour bouncing off the roads prevented us from walking along the road that went around the temple. 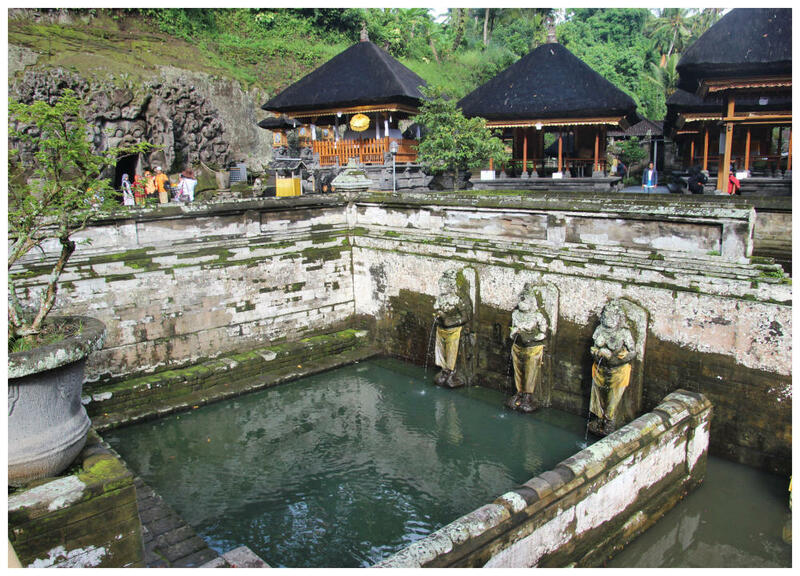 Gunung Kawi (Poet Mouintain) is an ancient Hindu temple complex situated on the Pakrisan River in Tampaksiering, north-east of Ubud. Dating from the eleventh century, this is presumed to be the burial complex of King Anak Wungsu and his many wives. It is reached by climbing down 300 steps. The location at the bottom of the steep valley is on a lush green valley lined with paddy fields. The smaller complex on the south side of the river is presumed to have been built for the King's wives, while the larger complex is thought to have been the residence of the King himself, and perhaps his concubines. The 10 shrines are carved into the sides of a steep river valley, and the river crossed by twisting trees and vines. More rain and out with the umberellas! We thought that we were cursed as it rained during every temple visit but our cheerful, positive guide said it was a blessing from the Gods! 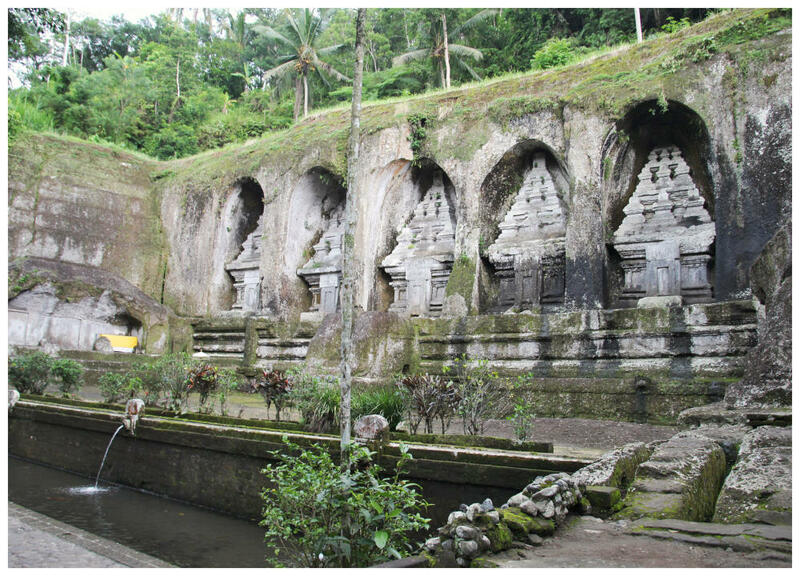 Goa Gajah, located about 4 km east of the centre of Ubud dates back to the 11th century. The ruins comprise a temple, several monuments and shrines, ancient bathing pools, and the famous "Elephant Cave". At the facade of the cave is a relief of various menacing creatures and demons carved right into the rock at the cave entrance. The primary figure was once thought to be an elephant, hence the nickname Elephant Cave. The cave is shallow; inside are three stone idols each wrapped in red, yellow and black cloths. The site is mentioned in the Javanese poem Desawarnana written in 1365. An extensive bathing place on the site was not excavated until the 1954. These appear to have been built to ward off evil spirits. 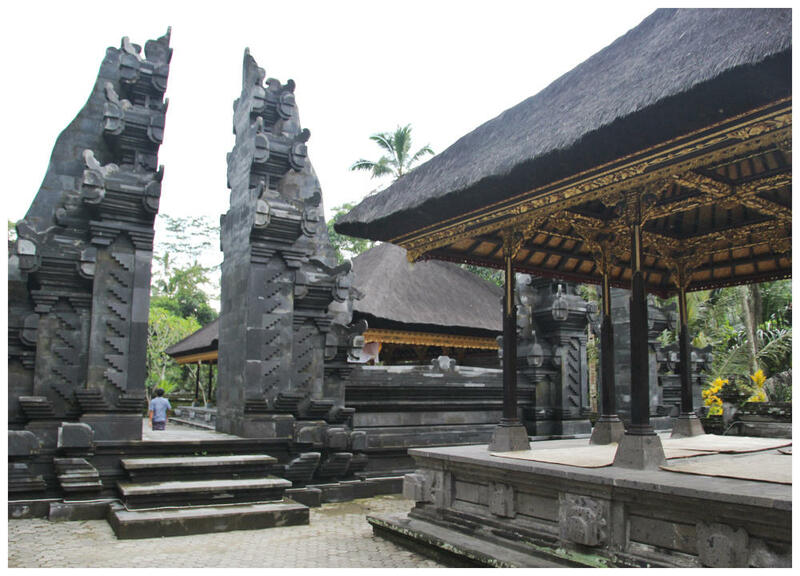 The Semara Pura was established when the Dewa Agung dynasty moved here in 1710. The palace was laid out as a large square, believed to be in the form of a mandala, with courtyards, gardens, pavilions and moats. Most of the original palace and grounds were destroyed by the 1908 Dutch attacks. The Pemedal Agung, the gateway on the south side of the square, is all that remains of the palace itself (check out its carvings). Two important buildings are preserved in a restored section of the grounds. In the north eastern corner of the complex, the Kertha Gosa was effectively the supreme court of the Klungkung kingdom, where disputes and cases that could not be settled at the village level were eventually brought. This open-sided pavilion is a superb example of Klungkung architecture. 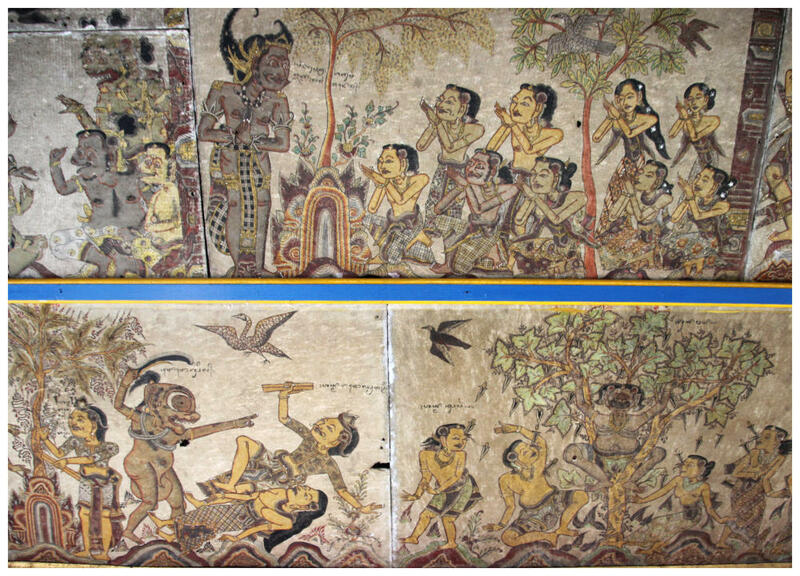 The ceiling is completely covered with fine paintings in the Klungkung style. The paintings, done on asbestos sheeting, were installed in the 1940s, replacing cloth paintings that had deteriorated. 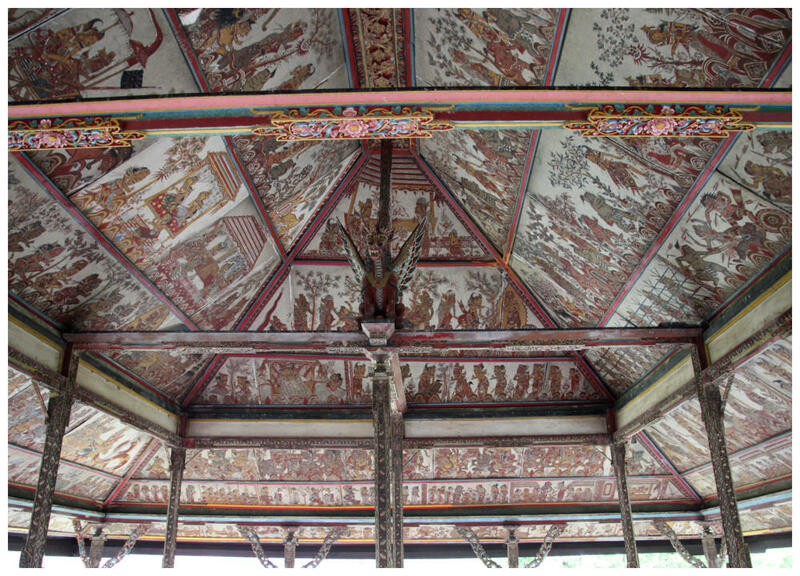 The ceiling of the beautiful Bale Kambang l 'Floating Pavilion' is painted in Klungkung style. Again, the different rows of paintings deal with various subjects. The first row is based on the astrological calendar, the second on the folk tale of Pan and Men Brayut and their 18 children, and the upper rows on the adventures of the hero Sutasona.